THERE’S NOT MUCH going on this week. I suppose we could be talking about the new — and quite maddeningly vague — security rules affecting passengers arriving in the U.S. from overseas, but there’s little to be said that hasn’t been said a hundred times in these pages. If you feel that handing out questionnaires to departing passengers is a legitimate means of thwarting terrorists, and a useful way of spending resources, well good luck to you. But the heck with that. Instead of some frustrating rant about security, let’s get nostalgic and return to one of my perennial favorite subjects: airline logos. It’s without irony that the logo of All Nippon depicted Leonardo’s 16th century “helicopter” design — a corkscrewing flying machine that, while an impressive statement of the artist’s vision and intellect, could never have gotten off the ground. That’s a hard sentiment to pin down. Were they just being cheeky, or was it something deeply respectful and reflective — a logo that symbolized four-hundred years worth of dream and ambition, a culmination of the journey from theoretical flying machine to the Lockheed L-1011? Whatever it was, it was the sort of incredibly cool logo that no airline in 2017 would ever consider using. It’s too intense, too esoteric, too meaningful in an age where corporate identity is sought not through meaning or concept, but through garish colors and swoopy things. No, they don’t do airline liveries like they used to. Not for the most part, anyway. I’m a sucker for those that at least make an effort to incorporate some sort of cultural or historical message, and fortunately there are still a few out there. Aeromexico’s Aztec-inspired “eagle knight,” for instance, is a great example, and JAL’s tsurumaru crane is the prettiest thing in the sky. EgyptAir’s falcon-headed Horus is maybe the ugliest thing in the sky, but at least it means something. The best ones, maybe, are the ones where you need The Google to help you out. I’m thinking especially of Iran Air’s peculiar logo. Inspired by the character of Homa, a kind of bird-horse-cow griffin carved on the columns at the ancient Persian site of Persepolis, the symbol was designed 1961 by a 22 year-old Iranian art student named Edward Zohrabian, and has been used ever since. How many companies have stuck with the same logo for 56 years? Iran Air is in the midst of transition, and it’s just a matter of time, I worry, before this enduring mark is dustbinned for some stupid swoosh. Like Leonardo’s copter on the tail at ANA, it’s probably too old-fashioned, if not outright perplexing, by today’s standards. It’s also vaguely fetal and creepy-looking, I agree. But here’s hoping they keep it. The fun thing about the first picture is the Lockheed TriStar name on it. While Lockheed was never a contender, they at least tried during Jumbo era. All-time Favorites: Alaska Air (the famous Innuit is so unique and friendly looking); Cathay Pacific (love the one-stroke calligraphic effect of the bird, although I preferred the previous color scheme to the new all-green); Saudi’s palm tree with crossed swords; KLM’s deep blue and simple crown; and Royal Jordanian’s unique color scheme and classy crown. Not so bad – South Africa’s rainbow flag motif has grown on me; I like the “famous Norwegian” tails on that carrier; and Thai’s garish purple is always easy to spot. Pretty blah – SAS, ANA, TAM – can’t you come up with anything more imaginative than the initials? Air China, which always reminds me of a flying chicken. United’s bad Continental mash-up never did it for me. The Deplorables – Delta’s drab and meaningless triangles;, Etihad’s new one, like desert funhouse mirrors; and especially Iberia’s awful modern-art color blob. And despite being an improvement over the horribly multicultural “we are the world” designs of British Air 15 years ago, I’ve never liked the BA ribbon – bring back the Union Jack section above, BA! I always love your livery/logo articles Patrick: I find myself casting a more critical eye these days. 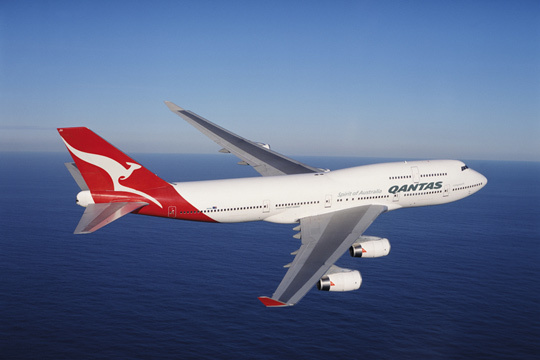 Wanted to comment on Qantas’s livery having just returned from a trip to Sydney on the 747-400ER. Nothing makes my heart gladly and proudly leap more than seeing that big Kangaroo on the tail — there’s rarely more than 2 planes at a time (LAX usually) but you cannot help but see that tail and it’s stunningly beautiful. That logo too remains in use. You’ll see it on Air France’s engine nacelles, and on its pilots’ caps. Yes, logos are important and so few get them right. Or,they have them right then ruin them. American comes to mind. Before, a simple but pleasing orange-ish logo on an unpainted fuselage. Dignified in a military sort of way. Now? That striped tail? Yuck. There’s no counting for taste, is there. Colors are important of course. In my view, some colors just do not belong on aircraft. Northwest Orient had a hard red as you’ll recall. An earth color, definitely not a flying color. Many carriers do have a splash of red, logo or livery. But the jaunty, “light” red, not the heavy iron ore look. I can’t think of one which is just totally right. Your BA choice? Southwest’s former colors were disgusting in my view. Boring desert. Now they’re almost TOO colorful. BA, Air France, KLM come to mind as dignified flying colors. Stately, even. As befits an international, a global. Diversion into WOW service: friends & I recently flew WOW. EVERYTHING, was for sale. i have an artificial knee and it can get stiff. I explained to an FA. Could I move to open Exit row seat? Yes, for $59. That offended me. I moved, paying them nothing. They got their revenge by rolling drinks cart right past me. Looks like a cutesy-pie sea horse with wings. Weird. It does not bring Iran to mind. And how could you forget little Reno Air? The three little mountains, which if you look roughly southwesterly from RNO, you will see them. A regional depiction of its home base, which you profess your love of. The “A” in “Air” depicted the profile of an airliner wing. It retained the classic cheatlines. The green and silver colors were a touch of class. The “Reno Air” font itself was a bit cheesy, and perhaps could’ve been done differently. But otherwise was a very handsome color scheme. And there’s the Koru on Air New Zealand.To quote Wikipedia,” It is a stylised representation of a fern frond unfolding, and signifies new life, growth and renewal. The koru was used on the prows of the early Polynesian canoes that sailed the Pacific with its many islands. The koru was first applied to the tail of Air New Zealand aircraft with the arrival of the DC-10 in 1973, and has remained ever since.”Also the new look(2013) has the Silver Fern(N.Z. national symbol and trade mark) on the rear body with a change of colour from Pacific Blue to Kiwi Black. As to Leonardo’s airscrew: I happen to be reading Walter Isaacson’s biography of the great man. He suggests that this was not meant to be a practical flying machine, but a stage prop. The Medici rulers of Florence were constantly staging plays, pageants, and public spectacles, many of which involved flying angels, falling stars, ascending Christs, fantastic birds and dragons, etc. Leonardo was involved in designing the machinery for these events. Isaacson suggests that the “helicopter” might have been used in one of these presentations, perhaps flown on a hidden cable powered by a spring. One that has always perplexed me: Look up Grand Airways. They were based at Las Vegas and flew a couple of DC-9’s for about five minutes circa 1995 or 1996. What the heck is that tail logo all about? The first thing that comes to mind when I see it is a Japanese Benihana restaurant, not a sunbelt airline flying LAS-DFW/IAH. Look it up and let me know. Speaking of LAS, what about the stylized ribbon logo from National Airlines that flew 757’s out of there? I always thought that one was simple. Indeed the livery itself managed to be both simple and yet attractive. But for sheer cheesiness, you would have a hard time topping Air 21. The Fresno based airline that also flew….to LAS….also in the mid 90’s, using a pair of Fokker 28’s. I don’t know what that Grand Airways thing is. It looks like a beehive. As to the LAS-based National Airlines, that ribbon was a little too fancy for its own good, I think. And their typeface was horrible. Air 21, though…. cheesy, sure, but how can you not like that one? That strange, retro-futuristic aesthetic, it looks like it’s from a schlocky 1960s movie, or from a comic book. Not one with an arcane derivation I know, but I’ll be sad to see the Monarch logo and livery disappear. I thought the crowned “M” worked really well, especially in the more abstract later versions and the combination of black and yellow was pleasantly eye-catching. The trouble with the old All Nippon logo is that you have to peer at it and analyse it for a long moment before (hopefully) understanding. That’s fine for a book cover, not an airplane. The beauty of the great logos — the old BA and BEA ones, PanAm, Alitalia for nearly half a century, Air Canada’s original 60s maple leaf nearly encircled (to suggest movement), Swissair’s final Swiss flag (with a chocolate stripe along the fuselage), etc. — is that they are instantly graspable, and beautiful. Did I forget Air France? A slightly abstract jet-age slanted version of the French flag. Magnificent. What about Air France’s flying seahorse? The flying seahorse was the logo of one of AF’s predecessor airlines, Air Orient. It lives on today on AF’s nacelles. I tend to think the ANA logo creaters tended more toward respectful, as it has another connection. The helicopter is a nod back to the original corporate name, Japan Helicopter and Aeroplane Transport Co (Nippon Herikoputā Yusō). That’s also where their “NH” IATA airline code comes from. That’s probably too much thought for a “modern” logo, though. Great intel there, George, thanks! I’ve wondered about the NH code. I wonder if the solid red in the upper part of BA’s tail design might be a nod to the “Red Square” of British European Airways, the predecessor company that merged with BOAC to form BA. As to the longevity of logos, Lufthansa’s crane goes back to its previous life as Deutsche Luft-Reederei in 1919. Had not seen the significance of the red top, which likely explains the question I was going to ask which was “why didn’t they use the *upper* left portion of the flag, as the tail is vertical? I think you’re right in it coming from BEA, but not the red square livery, but it’s successor called the Speedjack with half a Union Flag on the tail which looked something like a red plane in flight. With a passion for the obvious, Qantas has used the kangaroo logo since 1944. It grew wings in 1947, but lost them again in 1984, since when changes have been minor. I’m biased, but that’s my favourite. Simple, elegant, as you say largely unchanged, and completely recognisable – both as the brand and what it is. Even though I’m not living in Australia anymore, seeing the flying kangaroo still stirs something inside me. I would have to disagree about the BA logo. To me, it looks like something that came from a classroom exercise that was well received as being “deep”. There might be some folks in the United Kingdom that might get the flag symbolism but for most folks it would not have any impact. Well, I instantly recognized it as a slice of the Union Jack before Patrick illustrated it; it’s certainly not an obscure flag known only to a few. With regard to Leonardo’s “corkscrewing flying machine,” propellers were (and occasionally still are) called airscrews. Saw a couple Caribbean Airlines birds yesterday at FLL; it’s classy, though they could use a higher-quality picture of a Hummingbird. Check out Azores Airlines and SATA Azores. They use a lovely origami-like rendering of a hummingbird on their tails. 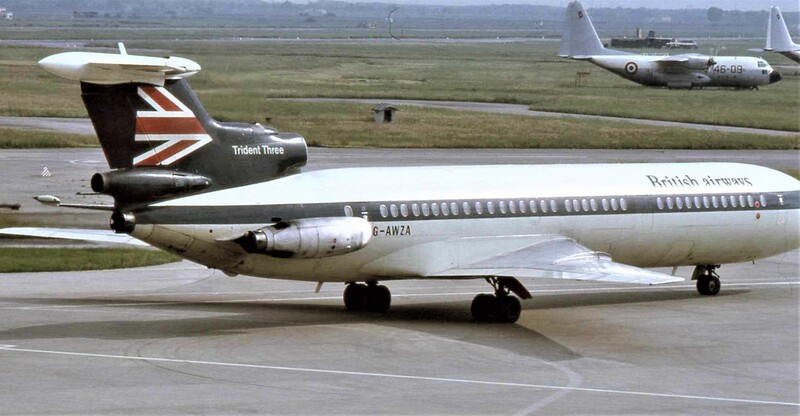 SATA had a whale motif on the fuselage for a while, too. Or is it there still? SATA flies into BOS, which I believe is its only American destination. The baleen whale is painted on Azores’ A330-200 CS-TRY. It’s still in service. They caught my eye while I was waiting for my WS flight at YYZ when they served it with an A310, since retired. I thought that was one gorgeous bird when it pulled in!